Another month has passed and here we have a list of popular Tizen apps from the store. The data is released for month of March to show which developers are doing best work with their apps. It is also important because Samsung is giving many rewards do developers who are more valuable as well as popular in between users. The rewards are upto $9 million for winner and upto $10,000 for remaining top developers, that’s why there are now more rush and more competition for the first rank. The list for last month has now declared and some new apps have emerged into the top ranking by defeating some old players. The king in the ranking is WhatsApp Messenger, since so many days it is number one app into the store and looks like don’t want to leave its place. The other all top 20 apps from the last year are present in this rank. 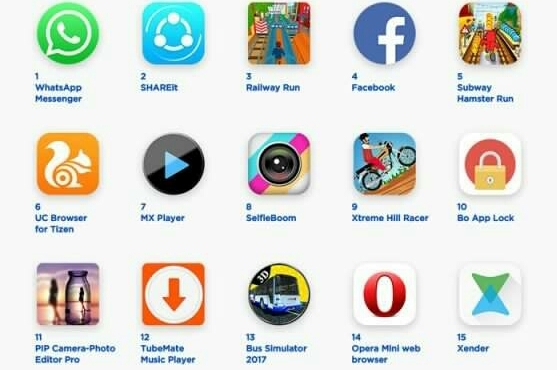 The social media apps Facebook and Facebook Messenger, Content sharing apps SHAREit and Xender are also got there place in top 10 apps. The new games Railway Run and Subway Hamster Run has come into the first top 5 apps. UC Browser, Opera Mini, UC Mini Browser are enjoying their sweet spots along with video players MX Player and VLC Media Player. The other apps in the list are Instagram, OLA Cabs, Temple Run 2, Chhota Bheem, Asphalt 8: Airborne, Asphalt Nitro, Hotstar, Pip Camera and Hill Climb Racing. The all four Jio apps are available into the top list. The first one is My Jio app and later Jio Cinema, Jio TV, Jio Music and Jio Express News apps are present. Interesting thing is all Jio apps are not available for Samsung Z series phones. If you missed some apps from this list then go to the store and download them. To view all the top 100 app list for to Tizenincentive.com website. It depends on developers. You can request to official developers on their website. could someone please tell me how to share or download shareit and other apps to my Tizen . I dont enjoy my handset because even from Tizen store its not easy . Why is it difficult to download shareit on Tizen ? even from tizen store .